Here are some preview stills from REVENGEANCE. 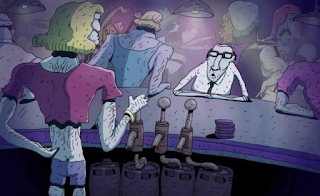 Art and animation by Bill Plympton. Character design and story by Jim Lujan. Colors by Sandrine Plympton. Plymptoons Studios in NYC is currently hard at work on the original animated feature film scheduled for 2016. Picture the Big Lebowski with a bit of Pulp Fiction thrown in with the classic Plymptoons feel in GLORIOUS 2-D HAND DRAWN ANIMATION! !